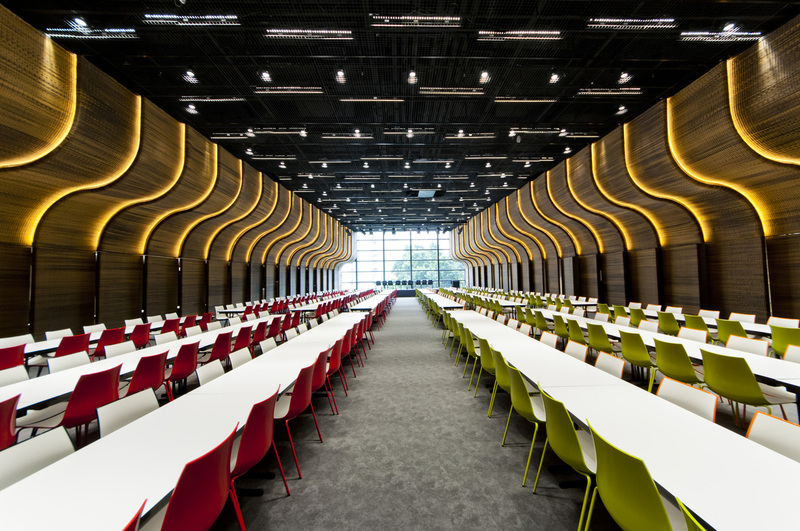 HKU Dining Hall / Auditorium by Index Architecture Ltd. 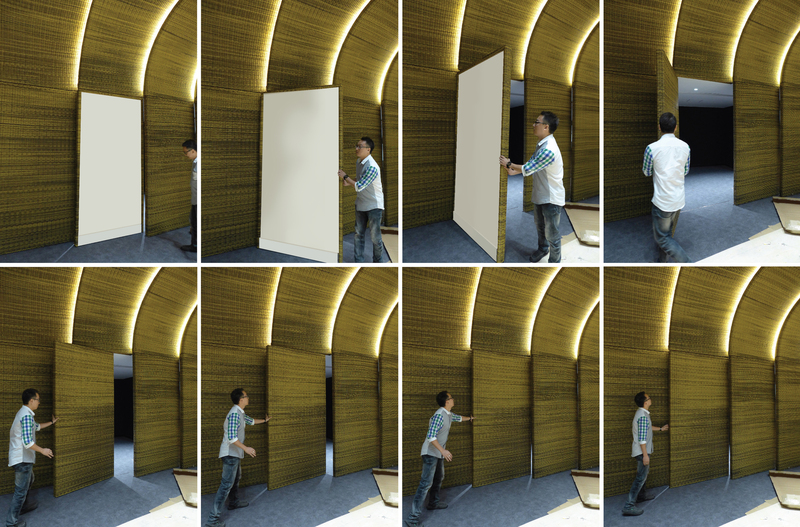 The clients would like to have a multi-purpose room which functions as cafeteria, lecture theater, exhibition space, as well as catering for the yearly HKU’s traditional “high-table” dinner for this residence hall. Upon our first site visit we were told that all the existing infrastructure, namely 6 sizeable air ducts and the miscellaneous chilled/hot water pipes, electric data wiring etc, were not to be touched and could not be re-routed. They ran along the North and South side of the hall and presented an extremely negative visual impact. The full of the ship functions as a skin to conceal the functional components of the warship, not unlike the situation of the ducts and wiring of dining hall. 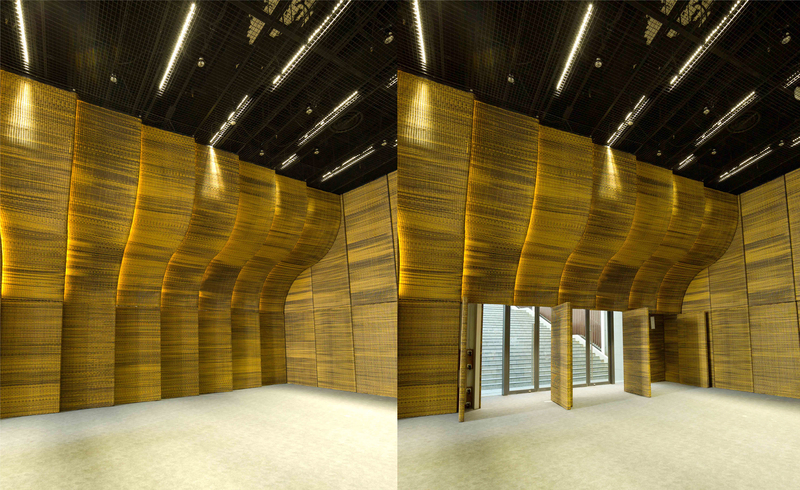 We imaged the space to be clad by three-dimensionally curved panels that form a “half-hull” on both side of the space. Geometrically, each panel is slightly different than the next in order to fit the infrastructure elements behind. The architectural experience directs the view to the nature and beyond. 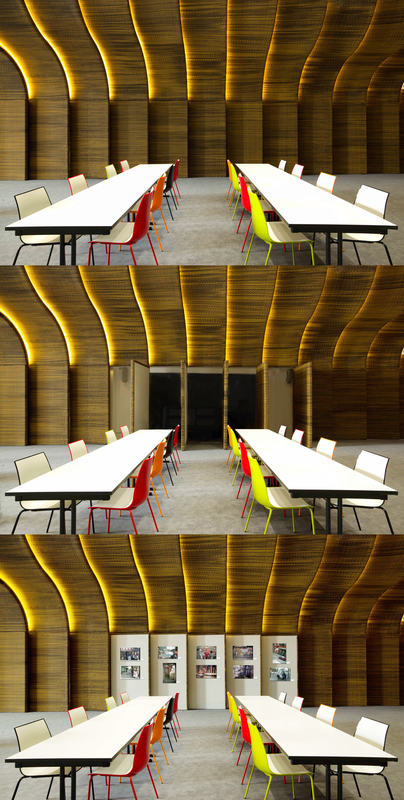 The panel is design as weaved synthetic rattan sandwiched with acoustical batting. 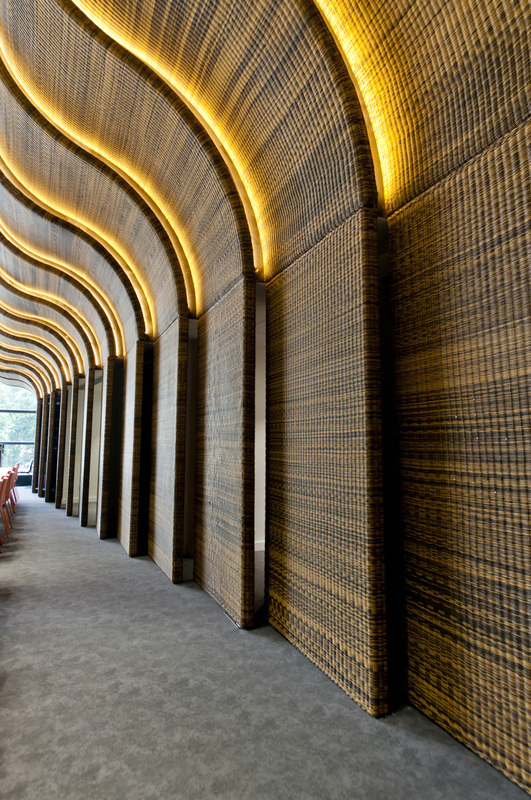 Rattan is the perfect material to accommodate both the warped surface while providing acoustical performance. Where the panel turns vertical one can pivot it 180° to reveal the “other” surface designed for display, thus meeting the exhibition flexibility requirement of the clients. The choices of material for both the ceiling and the floor are of darker tone in order to accentuate the unique geometric formation of the hall.